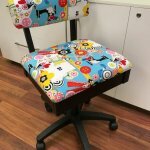 Our Hydraulic Sewing Chair is a perfect accessory for any craft and sewing room. 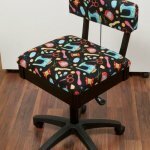 The chair comes in your choice of heavy-duty fabric – a Riley Blake Sewing Notions motif, a Riley Blake Button motif, or Alexander Henry's cute Sew Now Sew Wow motif. The chair's black frame accents all of these fabrics beautifully, and is sure to match any décor in your craft room.